Analyze only specific files – only include the files that match a list of file patters like *Core*.cs or Modules\*. See this KB post for the file path patterns details and examples. The Summary Report tab provides an overview of the analyzed source code quality, it includes the high level summary of the current analysis information, filters, violation summary, top N violation, solution info and metrics. Additionally it provides detailed list of violations and excludes. The report is self-contained – no external dependencies, everything it requires is included within the html file. This makes it very easy to email the report to someone or publish it on the team portal – see example. 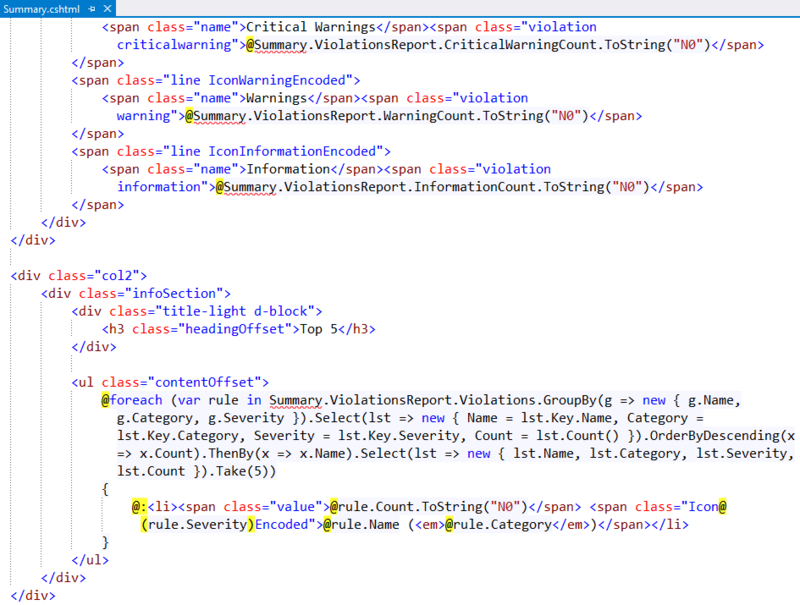 The Summary Report is based on an ASP.NET Razor markup within the Summary.cshtml template. This makes it very easy for you to customize it to your needs. You will find the summary report API documentation in the help file – CodeIt.Right –> Help & Support –> Help –> Summary Report API. We would love to hear your feedback on the new features! Please email it to us at support@submain.com or post in the CodeIt.Right Forum.